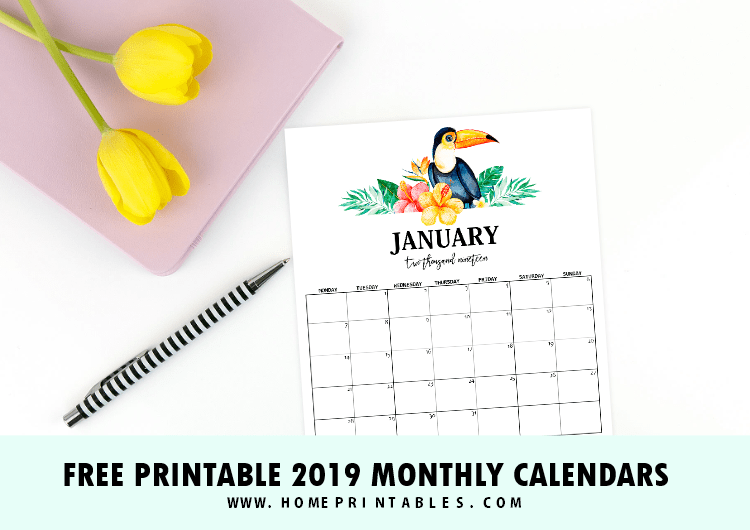 Free Printable Monthly Calendar 2019 in Vibrant Tropical Forest Theme! Looking for a free printable monthly calendar 2019? 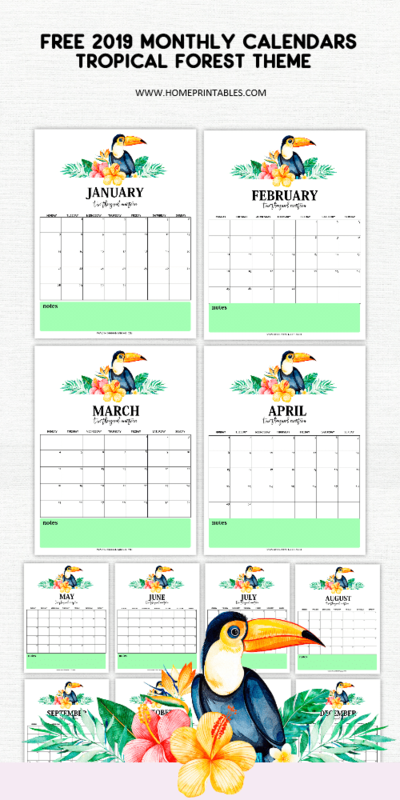 We’re happy to share this new calendar in tropical forest theme! 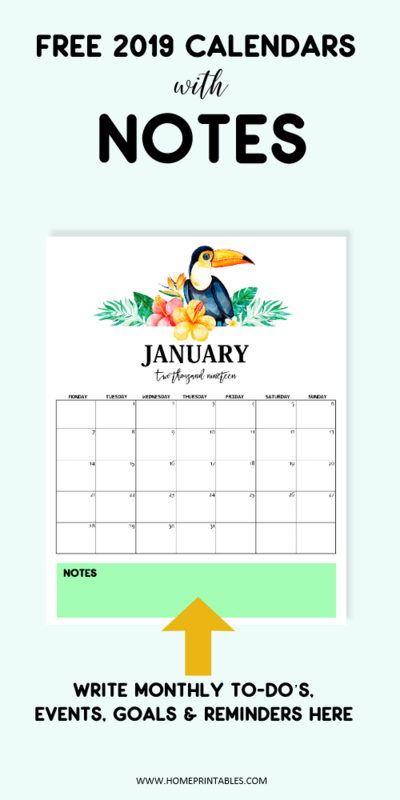 It’s a vibrant calendar design with bold tropical flowers and toucans! Get yours today and use it right away! Yup, it’s absolutely for FREE! It’s freebie time again! We know that by now, you’re starting to scour the net for your 2019 organizers and so we keep sharing fresh designs! In fact, we have a wide collection of freebies already, all designed to help you run your days blissfully and productively come 2019! And today, another beautiful calendar is out! How we love this bright and bold calendar inspired by the charm of tropical forest. Thanks to Kate Rina of Design Cuts for the beautiful graphics she created! It’s so adorable! This free printable monthly calendar 2019 can be used in so many ways! 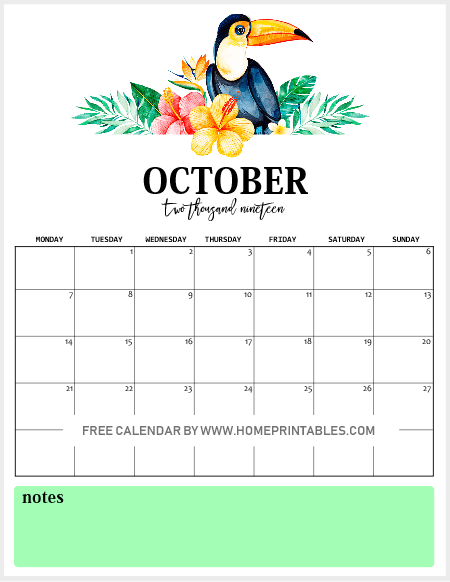 You can bind them together and have them handy on your workstation for easy and organized planning or have them as monthly planners for your home use. The possibilities on how they can be enjoyed is limitless! They can even be used by teachers and students in school! Here’s a quick preview to each of the monthly calendar we have for you. The download source is towards the last part of the post so be sure to scroll down till the very end! Free Printable Monthly Calendar 2019 in Charming Tropical Forest Theme! Plan your days ahead with these truly charming and vibrant calendars. They’re great to use to organize your schedule. This Printable Monthly Calendar 2019 Has Room for Your Notes! Aside from its beautiful design, we also love that this printable monthly calendar 2019 has a room for your notes. 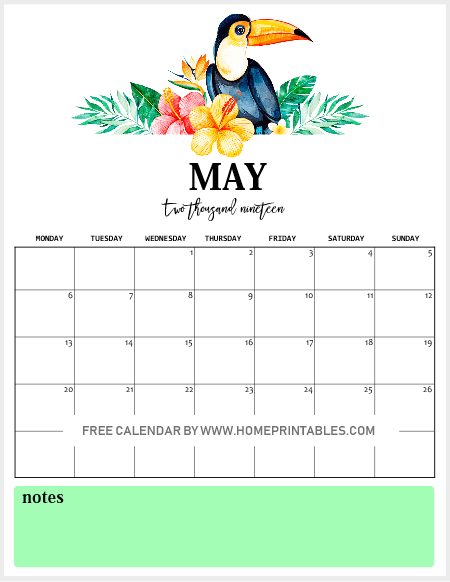 Yup, towards the bottom of the page, you can scribble your reminders for the month such as dates to celebrate, meeting and appointments, goals to achieve, task list and so more. This calendar is going to be very useful for you, we believe! 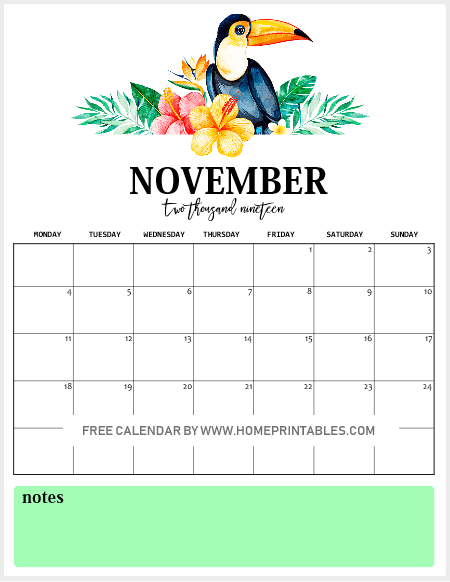 POP OVER HERE to snag your free calendar. You’ll be directed to the printable file in PDF that can be downloaded instantly. Please note that this free calendar fits perfectly in US standard letter-size paper. It also prints great on A4 sheets, just be sure to adjust your printer setting to “FIT TO PAGE”. Lastly, you might want to snag our free 2019 planner, too! 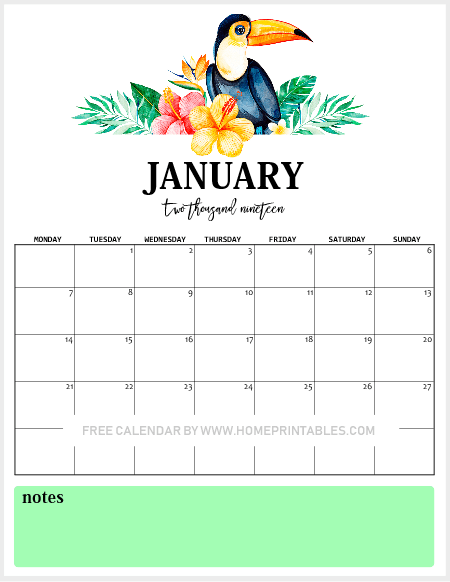 Check out The Green Life Planner and The 2019 Design a Life You Love Planner. They’re beautiful! Have an awesome 2019 friends! Thanks for stopping by! Thank you so so much! I absolutely LOVE this calendar! So unique and useful! Thank you again!